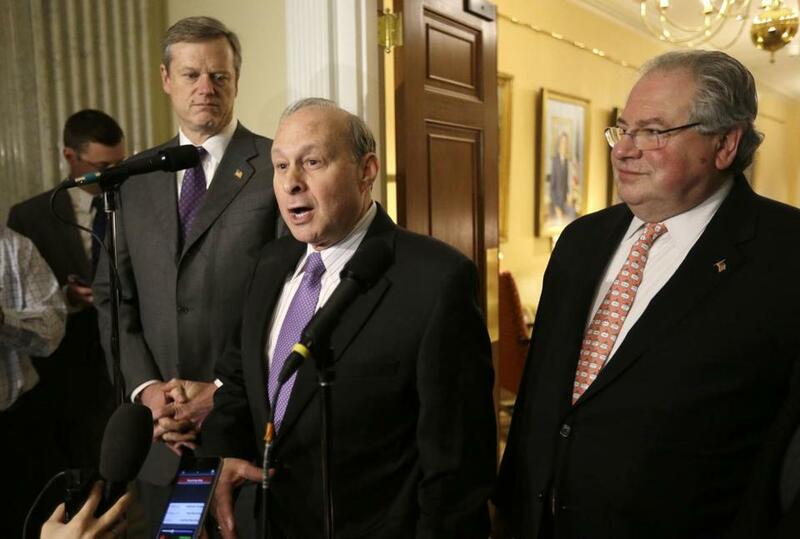 Governor Charlie Baker (from left), Senate President Stanley Rosenberg, and House Speaker Robert DeLeo. A great many people have weighed in on the MBTA’s breathtakingly woeful performance. Solutions abound, including privatizing the agency, hiking fares, shifting debt to other departments, selling assets, and reconfiguring pensions. But who ultimately will be responsible for fixing the T? It will fall to the “Big Three” — the governor, the speaker of the House, and the Senate president. The implementers of any solution will likely be appointed experts, but the burden of coming up with a plan is on the Big Three. In order to be successful, they must face one inescapable fact that should drive any plan to solve the mess: The T is bankrupt. It should be treated as if it were in receivership. The T operates in deficit every year and needs Commonwealth handouts just to pay operating costs and growing debt obligations. This week, it declared that it needs $6.7 billion to cover its maintenance and repair capital needs. Five years ago, in a report I authored, this number was already a staggering $3.3 billion. At this rate, in five more years, it will double again to almost $14 billion. The reality is that the MBTA was bankrupt in 2009 and is only sinking into a deeper financial chasm. We need to stop this madness. Rather than get lost in the details of this mess, which has been documented elsewhere, let’s stay focused on who needs to take the responsibility to fix it. Governor Charlie Baker didn’t cause this absurdity, but he sure owns the future. And he is the right guy at the right time. He is not a policy wonk nor a shirker. He understands finance, state budgets, municipal debt, and sorting through complex problems. He saved Harvard Pilgrim from bankruptcy when he was its CEO, and knows how receivership-type management can turn a large organization around and head it in the right direction. The commission he recently appointed to study the T’s practices will essentially update the agency’s problems, so his actions will be based on credible third party verification. The governor will need to come up with big, bold ideas to radically change the dynamic. He is certain to consider the above solutions, but he will also have to go further, including: establishing more accountable and transparent MBTA governance, reassessing and reallocating other government spending programs, finding new revenue sources, implementing sweeping refinance, dedicating casino revenue to the T, slowing MBTA expansion, shifting convention bond dollars. These types of actions are based on a receivership circumstance. One problem is that lawmakers have already “reformed’’ the T a number of times in the last 25 years. Both Senate President Stan Rosenberg and Speaker Bob DeLeo have participated in all of these reforms. DeLeo recently said we have to “take a look top to bottom at the MBTA.’’ Yet just since he has been speaker, there have been two major “reforms,” and the result is that the MBTA maintenance and repair needs are 100 percent higher — and climbing. DeLeo spent years and untold political capital on trying to save a few hundred jobs at Suffolk Downs by promoting a casino in East Boston while the MBTA continued to crumble. Perhaps a little more time and energy worrying about how hundreds of thousands of citizens get to work and school everyday was in order. Truly remarkable reactions from our leaders to the profound MBTA catastrophe. Former John Hancock CEO David D’Alessandro was the author of a 2009 review of the MBTA.